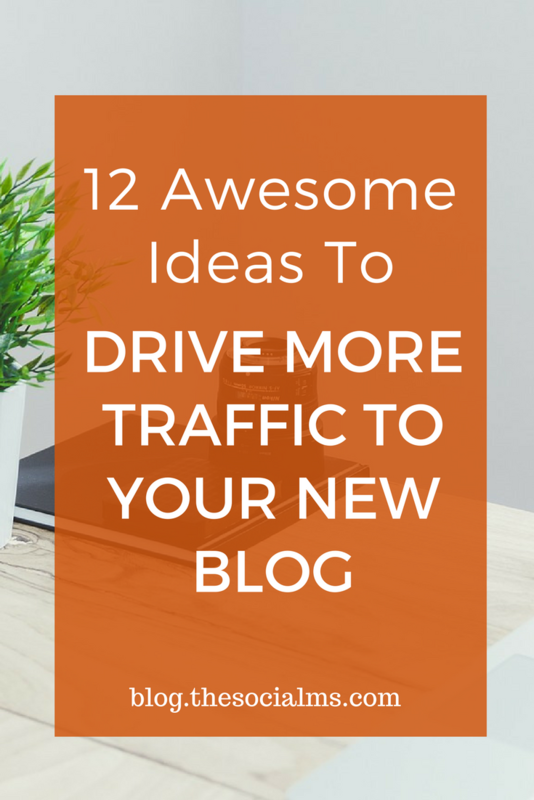 One of the biggest challenges for bloggers is to drive more traffic to their new blog. How to find and grow an audience, to attract readers and how to get the first people to share your blogs, is not a trivial question. Even with putting in a lot of effort and trying a lot of different methods, many bloggers get frustrated and eventually give up long before they actually found a way to build an audience or community around their blog. On the other hand, there are a lot of different things you can do to boost your blog traffic, and most of them are open for new bloggers to use for their own blog. And it usually is not Google or search traffic that will be the answer to your traffic problem when you are just starting out. Do not keep your blog a secret. If you are blogging for an audience then you need to tell this audience about your blog. Do not be afraid to intrude on them. Telling your contacts once about your new blog is not an intrusion, it is information. Some of them may well profit from the information you give on your blog. Instead of asking them to share or promote your blog or post, you should consider to ask them for feedback. For one, this is much less spammy than asking them to help you promote it and as a side effect, the feedback could help you optimize your new blog to attract a larger audience. Even if your social accounts are still small, since you are just starting out, you should still share your blog posts there. After all: If YOU do not share your content, why should other people do it? Create images for the social networks you want to focus on. Social networks like Facebook or Pinterest will not give you any audience to speak of, if you do not provide an image in the right format. Make sure you also provide share buttons and make it as easy as possible for your existing audience to share your content. They are your allies in growing and audience if you succeed in getting them to share your content your audience will eventually grow. In some networks like Twitter you can also re-share your content later. Since statistically only a small percentage of your followers will notice your post the first time the chances are good that you will reach a totally new audience with the second (or even third or fourth) share. Just make sure, you do not repeat yourself all the time and that you share enough different information. If you are active online there are quite a few places where you can link to your blog and where you can help people to find your blog: Your Email signature and your social media profiles are a good start. Once your social accounts start growing, also more people will find the link to your blog in your social profiles. Keep in mind that your comments need to add value to the posts you are commenting on. You want people to recognize you as a well-informed and helpful person who is desirable to connect to or to follow. A comment, which at first glance reveals that you only wanted to mention your own blog will often be seen as little more than spam. And before you start listing all the grammatical or spelling errors in the blog post you are commenting on, think what you would respect more on your own blog: someone talking to you about the topic you blogged about or someone who does not care what you post but whose sole purpose is to point out your grammar mistakes. Ask them for an interview, which you can publish on your blog. Most bloggers feel honored if asked for an interview. And they usually are proud of it when you publish it. Most of them will even help you spread the word about it by sharing it in their social channels. Ask if you can write a guest post for them. Guest posting is an excellent way to get yourself and your content in front of an audience, which someone else has already built. Keep in mind that a guest post is not a post about your own business but an informative post for the audience of the guest blog. You can still link back to your blog in the author bio. If you have some blogging contacts from your niche, you can ask someone to write a guest post for your own blog. This will add a new angle to your blog and the author usually will help you spread the word about his article. The headlines of your blog posts are a decisive factor for your blogging success. Nothing will guarantee the failure of your blog more than boring and uninteresting titles. If the subject of your blog is social media, a blog post titled “social media” will be utterly useless, no matter how significant or unique your content is. At the same time a post titled “The one important fact you did not know about Social Media” may well attract an audience. There are whole businesses built on the success of titles. Finding great titles for blog posts is a science. But you can certainly follow some best practices or even processes to find better titles. When creating headlines for your blog posts, also keep in mind that your headline needs to work in social media. For instance for Twitter you need a headline, which takes into consideration that in 140 characters you need to fit in the headline, a link and eventually a Twitter handle. I already mentioned interviews as a means of getting others to share your content. But there are more options you can use. Curate their content in a blog post “The best content this week” or “the best articles on this topic”. When you share this, again include the Twitter handle or Facebook Page of the mentioned authors. When you feature other bloggers in your content, you can also reach out to them via email or social media and directly ask them to share your content. The more content you have, the more content you can share on Social Media and the more content can be found via Google. If you already see some search traffic, more content gives you more opportunities to get traffic from search. If you already attract some readers to your blog, you want them to come back. One way to assure this is to offer some way to subscribe to your blog. A signup form on your blog or even an RSS feed can give you very faithful readers. For many bloggers, their email list is their biggest traffic source. Simply send out an email announcing every new post you publish. To collect more email addresses you should consider creating some Freebie, which your target audience would like to have and give that Freebie away on your blog or a landing page in exchange for their email address. Make sure the Freebie is closely related to the topic of your blog. You want to get yourself in front of your target audience and one place to find this audience is forums or groups around related topics. But keep in mind, that in most of these niche forums or groups people do not like new members to join, share a link to their blog and leave again. Most of the time these links will be removed and you may even get banned from the forum. Forums are for connecting and discussions. You need to take an active part in conversations in order to leverage forums and groups. Would it not be nice, if other bloggers/journalists ask you for your opinion or interview you on your niche topic? But how can you find journalists or bloggers who are interested in your opinion? Try H.A.R.O – Help A Reporter Out. On HARO journalists and bloggers are posting their requests for statements, interviews or views on particular topics. You can browse the requests and answer whatever matches your skills and knowledge. The HARO interface is simple to use. But for niche topics, you may need to wait a while until a well matching request comes in. Many bloggers link to older blog posts for more information. But have you ever thought about linking from older posts to new ones? If you have one or two articles that get more traffic than your other posts, then you can utilize this traffic for some of your other posts by linking to them for further information. Choose the links you place in the well-running posts wisely so that your linked articles provide additional information to the article that gets the traffic. Some of the visitors to the older but well-running post will then visit the newer article. When you are starting out with a new blog, one of the hardest struggles is to find the first audience and make it grow. While the above tips can help you find more visitors to your blog and grow your audience, it will still take some time to get a blog running and to build a considerable blog audience. Do not give up too early and try and find new ways to promote your blog all the time. And eventually, your audience will grow. Leave Tweepi And Turn To ManageFlitter. Now!